After listening to the 4:00 am weather forecast, it sounds like Saturday (tomorrow) morning may be my weather window for continuing south. 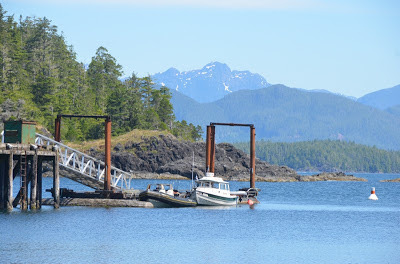 I still need to stop at Critter Cove Marina and Friendly Cove, so I departed Moutcha Bay in the morning for a day of work. Critter Cove is a neat spot. Rustic, in the same way many of the facilities in the Broughtons are. It’s built almost entirely on floats and caters to sport fishermen who moor their boats right outside their hotel rooms. I chatted with Cameron Forbes, the owner, for an hour or so. He built the place 20-some years ago and still loves coming here every summer. I wish I could have stayed the night, but alas, I had to move on. Friendly Cove is another cool spot. A small dock in the cove is available, or boats can anchor out. Friendly Cove is filled with history. Captains Vancouver and Quadra met here in the late 1700s to negotiate the treaty that gave England control of the area. The Mowachaht Band now control the property, and they have totems and historical information on display in their church. A nearby lake, just a short walk from the dock, is perfect for summertime swimming. 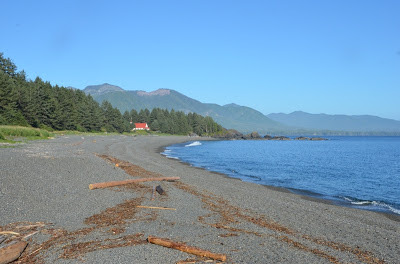 And beautiful gravel beaches are great to explore. 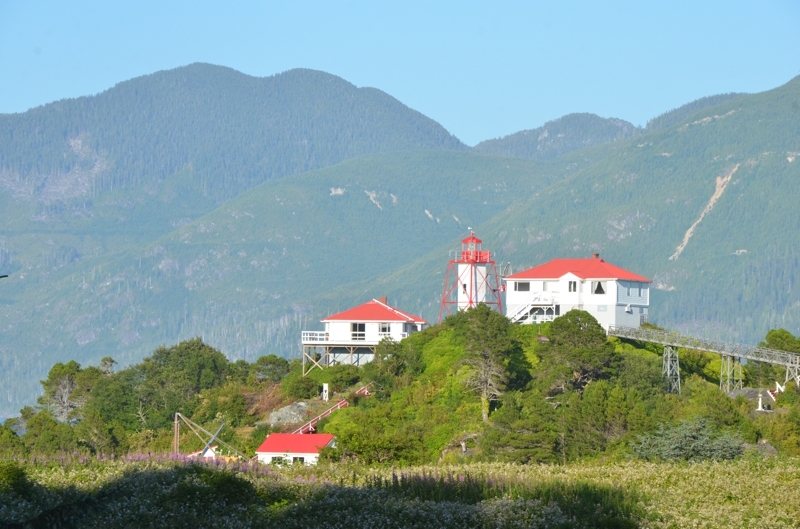 The Nootka Lightstation is also here, and it’s open to the public. I walked up and chatted with a nice couple who have been the lightkeepers here for nine years. The lightkeepers throughout B.C. do a tremendous service for mariners by regularly broadcasting current weather conditions: sea state, wind, visibility, etc. They also have search and rescue capabilities. Definitely a comforting presence! Stefan, from another C-Dory 22, was out fishing and stopped by the dock for a break. We visited for a bit and compared notes on our boats...this always seems to happen when boaters converse for long. Unfortunately the weather window that appeared this morning no longer seems to exist, at least according to Environment Canada. The locals, including the lightkeepers, said that mornings are usually fairly calm and I’d be fine to round Estevan Point in the early AM. I’ve been watching the observed conditions carefully, and I’ve noticed the same thing. Winds tend to die late overnight, and seas settle down a bit. So I’ll give it a shot in the morning if conditions look decent.